Our lovely- yet slightly battered and bruised- Trailcam spent part of the week in the bush with Steven. I have had it up at the house for a few days as well, but our road has been very quiet. A few hyenas doing their nightly patrol and a dikkop fascinated by something in front of our gate, but that is about it. Even when the Trailcam was in the bush with Steven, we did not catch a lot on camera. There is water everywhere in the veld after the lovely rain we had in the last 10 days or so. It is actually raining as I am writing this! A lovely way to start my Tuesday morning! 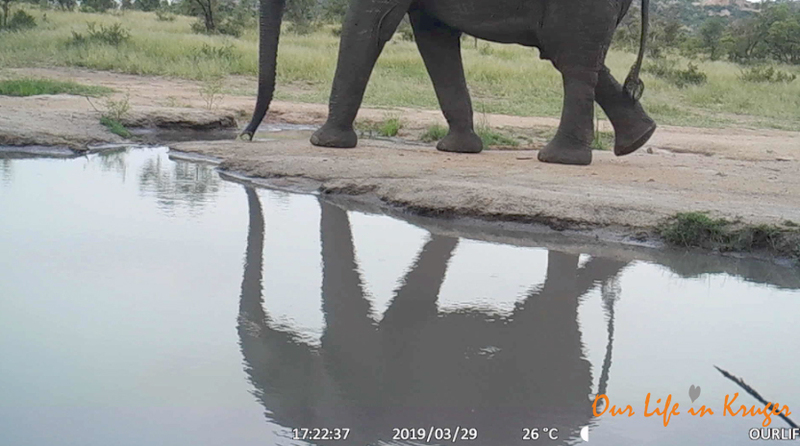 Steven put the Trailcam up at two different spots with water and he managed to get some great footage of rhinos and elephants. Their reflections in the water are what I love most about this footage. Somehow the settings on my camera changed to photo only. So I made a little sequence of them. Which looks pretty cool! Luckily the last part of the video has all the sounds of the bush we all know and love! Have a look at the video I posted on my Youtube channel. And feel free to subscribe! Our little Jack has been quite under the weather and feverish the past few days. Which is always a bit of a concern living in a malaria area. There have not been any recent malaria cases around here, so he probably just has the flue, but we will keep a close eye on him. I have literally been stuck under Jack for the better part of four days. Not a lot of time to write anything, for which my apologies. We will all be back to normal soon! Ah, thank you, Sal! Jack is on the mend, fortunately. Instead of Mr. Lips, he has been Mr. Grumpypants. Lol! Shame ja I battled a bit with the sequence, but finally managed with the program iMovie on my Mac. The footage in stills alone isn’t very exciting, but I love how the sequence turned out! He is much better today and almost back to his chirpy old self!! Thank you, Gaynor! thank you, Jenny! He is much better today! Brilliant …. thanks again Linda.